540 ACRE FAMILY ESTATE. 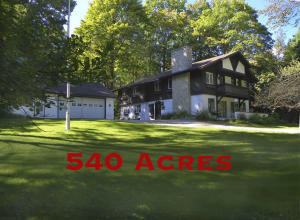 Absolute privacy, beautiful wooded property, with its own spring fed lake. Miles of maintained interior roads allow easy access to these private lands. Enjoy spectacular Fall colors from hilltop vistas, fish, hike, cross-county ski, ATV, horseback ride, entertain, enjoy nature. Features a large chalet-style home, 2-car garage w/guest apartment, guest cottage, a guest home suitable for a caretaker family, 2 utility garages and potting shed. Well maintained. Bring many friends and their families, ample space to accommodate guests with room to explore. This property is ideal for corporate retreats/events, camps, equestrian events, farming, family reunions and gatherings, a primary residence, or a great B&B. Detailed PDFs of the property are available upon request.